This post is kind of long and full of lots of "apparently's". July was full of lots of fun family activities. Key word = blazing hot sun. Not sure why the dock across the lake under some trees wouldn't have worked, but oh well. it was fun. #2 - Camping with friends in American Fork Canyon. Did you know that Utah is Bear Country? umm, yumm...that's the way to do it, B! How could I sleep peaceably with all of these cuties under our care? O.K. So apparently, this is not the first time that my baby has used a pocket knife to carve wood!?! What the heck? I guess this is what happens when he goes on Scout camp outs with dad. Not good. Not good at all. Look, he's a pro! 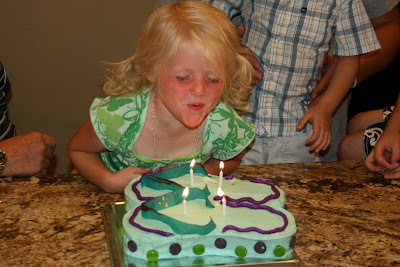 A little girl turned FOUR. and a new pink kitty from daddy. A boy got a hair cut from daddy. Dad did a pretty good job, eh? All look fun!! I love Blakes hair cut and the cake you made is adorable, what a good idea! I too love the cake! And your kids are adorable, as usual! I would be nervous camping too! Looks like you still enjoyed yourself during the day though! Awesome cake and love the Barbie bike! 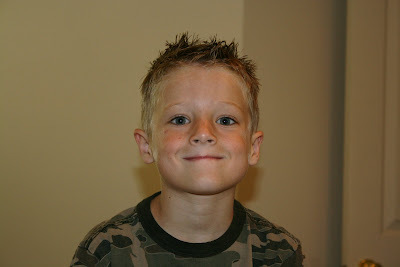 Blakes haircut looks great...We are SO getting ready for school to start around here! It all looks like SO much fun! The pictures of you at the Kool-aid stand crack me up. Way to supervise! The cake is darling! You are so creative!! Great post! I love knowing and seeing what's going on for you guys!!! Cute kiddos! I am NOT looking forward to school starting. My summer is zooming by, and I can't believe there is only 1 month left! Hi! I stumbled across this post searching for ponds and AF canyon. The pond you posted here with the rocks and ducks are exactly what I'm looking for a photo shoot. Would you mind sharing the location or name of this pond so I can find it this week? I would so appreciate it! You can email me at camilabinks@yahoo.com . Thank you! !